1981. 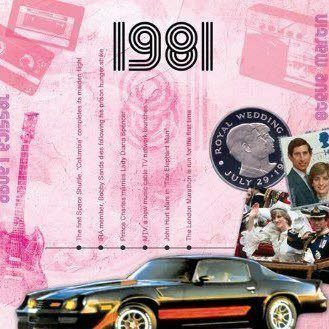 The two-fold card, together with the included 20-track compact disc featuring many of 1981 top artists and biggest hits, evokes a real sense of the year. You can listen to some of the great songs included with this CD Card below. 1. The Jacksons - Can You Feel It. 2. Haircut 100 - Favourite Shirts. 3. Adam & The Ants - Prince Charming. 4. The Pointer Sisters - Slowhand. 5. The Psychedelic Furs - Pretty In Pink. 6. REO Speedwagon - Keep On Loving You. 7. Electric Light Orchestra - Hold On Tight. 8. Altered Images - Happy Birthday. 9. Earth, Wind & Fire - Let´s Groove. 10. Sugar Minott - Good Thing Going. 11. Aneka - Japanese Boy. 12. Shakin' Stevens - This Ole House. 13. Kiki Dee - Star. 14. Dolly Parton - 9 To 5. 15. Champaign - How ´Bout Us. 16. Landscape - Einstein A Go-Go. 17. Bucks Fizz - Making Your Mind Up. 18. Heatwave - Gangsters Of The Groove. 19. Japan - Quiet Life. 20. Odyssey - Going Back To My Roots.